Gun ownership spans all types of American communities, but it is particularly common in rural parts of the country. Among adults who live in rural areas, 46% say they own a gun, compared with 28% of adults who live in the suburbs and even fewer – 19% – in urban areas, according to a new Pew Research Center survey. Rural and urban gun owners, in particular, differ in many ways. Three-quarters of those in rural areas (75%) say they own more than one gun, compared with 48% of urban gun owners. And while protection tops the list of reasons for owning a gun among both groups, gun owners in rural areas are far more likely than urban owners to cite hunting as a major reason they own a gun (48% vs. 27%, respectively). The relatively young age at which rural gun owners first acquired a gun is perhaps not surprising: Americans who grew up in rural areas are more likely to have grown up with guns in their homes. 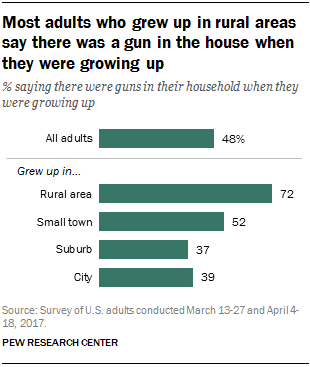 About seven-in-ten Americans who grew up in a rural area (72%) say there were guns in their household growing up, compared with half (52%) of those who grew up in a small town and 39% of those who grew up in a city. There is also a stark divide in opinion about the effect that guns have on crime depending on the type of community in which gun owners live. While 21% of urban gun owners say there would be more crime if more Americans owned guns, only 9% of rural gun owners agree. Another 57% of rural owners say there would be less crime, a view shared by 47% of urban owners. One key and defining characteristic of gun owners is the extent to which they associate the right to own guns with their own personal sense of freedom. About three-quarters of gun owners (74%) say the right to own guns is essential to their personal sense of freedom, compared with only 35% of non-owners. However, even among gun owners, there are significant differences based on the type of community in which they live. 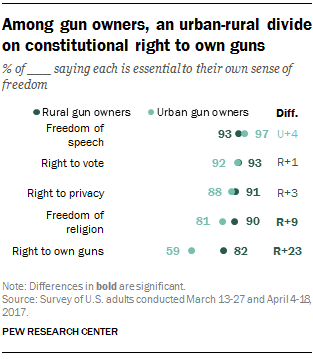 More than eight-in-ten rural gun owners (82%) say the right to own guns is essential to their personal sense of freedom, compared with 59% of gun owners in urban areas. One notable similarity between rural and urban gun owners is how they store their guns. 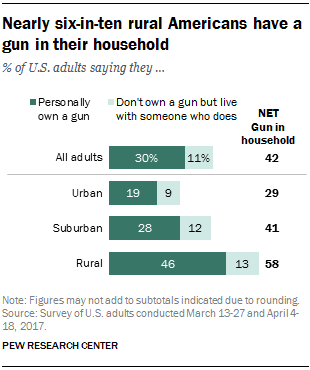 Similar shares of gun owners in rural areas (56%) and urban communities (51%) say there is a gun that is both loaded and easily accessible to them all or most of the time when they are home.